To survive 30 years in any industry is no simple feat, especially in the food service sector where the failure rate is said to be over fifty percent. But Vee Jays has conquered all to become an industry leader. Vee Jays opened its doors as a Roti shop in Paulâs Avenue on November 27, 1977, and has never looked back. When the Paulâs Avenue location became inadequate for its bourgeoning clientele, the operation moved to its Bay Street location, Vee Jays Downtown, in 1984. But that was only the beginning of several expansions and moves that would come. With the name Vee Jays becoming known island-wide, Julia Richardson, Johnâs last child, opened the Vee Jays Rooftop, upstairs a commercial building on the reclamation site in 1992. This venture became an instant success. However, Julia says its major drawback was that their mature clients had difficulties climbing the stairs to get to the restaurant. Johnâs youngest son Steve Minors also ventured out, turning a vacant lot on the beach at Villa into a food and entertainment hot spot, Vee Jays Dry Dock. This venture later turned into Club Iguana under different management. Vee Jays Prime Lime, which Julia describes as a pit stop, is located at Arnos Vale next to the airport; it mainly caters to the college and airport crowds, along with travelers and other walk-in clientele. Prime Lime became an instant success and is now managed by Ianthe, who is the longest serving employee, and also a relative. With its already established reputation for food, Vee Jays also became renowned as a watering hole, and has trained over two hundred young Vincentians in Food and Beverage service over the years. Many of the people trained by Vee Jays work on cruise lines and in hotels, bars and restaurants in St Vincent and the Grenadines and the wider Caribbean. Veronica John died in 1995, but two months before she passed, she purchased the downtown location, and Vee Jays restaurants became a Corporation. Julia, who is married with two children, mans the day time operations, while older brother George John controls the nighttime operations. Middle siblings Lynette Samuel and Steve Minors, who both reside in the US, are also involved in the business. After extensive renovations, including the addition of a second floor balcony, the Vee Jays Downtown location was reopened earlier this year. Boasting air-conditioned dining rooms on two floors, along with an open air bar and dining area with its trademark orange and green dÃ©cor, Vee Jays Downtown is once again the flagship restaurant. Soft spoken with a permanent smile, Julia Richardson has been the front woman for the Vee Jays Corporation since her motherâs passing in 1995. Despite her busy schedule, Julia took some time to speak with our reporter. SEARCHLIGHT: What is your recipe for success? Julia: Hard work, belief in yourself, a competent staff and faith in the one above. SEARCHLIGHT: What makes Vee Jays a successful establishment? Julia: Quality service and good home cooked food Vincentians have grown to expect. Our new motto is âA true taste of SVGâ. Cleanliness is also a big part of it. We insist on the highest standards at our restaurants. SEARCHLGHT: Is your role strictly administrative? Julia: No, not at all. If one of my staff takes ill, I will put on my apron and work in the kitchen, bar or where ever Iâm needed. As a matter of fact, last Tuesday when the cruise ship Ocean Village came, many of the passengers came, so I had to work in the bar. Boy, I tell you, the poor blender couldnât take the stress and broke down, so I had to do a lot of mixing by hand. SEARCHLIGHT: What is the toughest decision you have had to make? Julia: Getting out of Roof Top. It was like walking away from my child. But looking at the economics, I know I made the right decision. SEARCHLIGHT: Then whatâs your easiest decision? Julia: Coming back to Vee Jays Downtown, for the simple fact that itâs home. SEARCHLIGHT: Do you plan to open at other locations? Julia: Not really, except if itâs a really good opportunity, but Iâll like to see the name Vee Jays franchised so that it can be taken through out SVG, the wider Caribbean and the world at large. SEARCHLIGHT: What are some of the specials on your menu? Julia: First of all, Vee Jays is known for its roti, but we have steamed fish lunches and dinners. Wednesdays and Saturdays are our creole days. You are guaranteed to eat a meal thatâs totally Vincentian or Caribbean. SEARCHLIGHT: Whatâs in the future for Vee Jays? Julia: I would like to see customers come here for fine dining with wines and the full works. The business hours need to be extended so that at the end of the day, customers can relax and enjoy dinner in an intimate setting at Vee Jays. Located at Arnos Vale, adjacent to the airport, in the corner of the road leading to the Division of Teacher Education of the SVG Community College, Vee Jays Prime Lime bar and restaurant is what Julia Richardson describes as a pit stop. Prime Lime became part of the Vee Jays family in 2002, and although it is a smaller operation, it does robust business with its own loyal clientele. Mainly catering to the college crowd, along with travelers, airport workers, walk in and drive by clients, it serves mouth watering rotis and dinners, along with local juices and alcoholic beverages. Satisfying their patronsâ needs at the busy roadside bistro is a very dedicated staff. Manager Ianthe John started out at Vee Jays original roti shop in Paulâs Avenue in 1978. She has operated at all the Vee Jays locations. With an infectious smile and a motherly disposition, she and her staff share a genuine camaraderie. 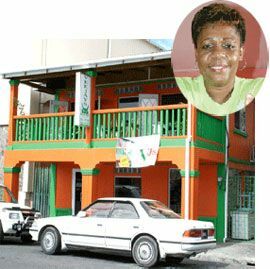 Ovetha Cato is the Prime Limeâs cook. She has been with the company for the last four years. Young Deltron Gordon, who hails from Chateaubelair, is the bartender. He received training in food and beverage service from Vee Jays and has been working with the company for the last eight months. Ashford David has been working at Prime Lime for the past year; he is the general maintenance man. Trevor OâGarro and Celia Boucher work the evening shift; heâs the bartender and security while she is the short order cook. They have been working at Prime lime for six months and two years, respectively. Prime Lime opens at 8:00 a.m. and closes at 11:00 p.m.